This unique pod-style house is in perfect harmony with nature thanks to use of natural building materials, organic profile and abundant windows. The main volume includes, on the main level, a grouping of kitchen, dining room and living room. One wing provides a carport which also doubles as shelter for the main entrance. The other wing harbours a clerestory windowed, 9’ ceilinged room which is suitable as a master bedroom, guest bedroom or den with adjoining full bath. A spiral staircase winds up to the second level – a large open space also suitable as a bedroom, or flex room, again adorned by magnificent window configuration. This level also provides discreet access to the observatory above, ideal for stargazing or as quiet space to enjoy the view. A popular model for those seeking natural balance and harmony!! Looking for other Vacation Getaway or Cottage Plans? 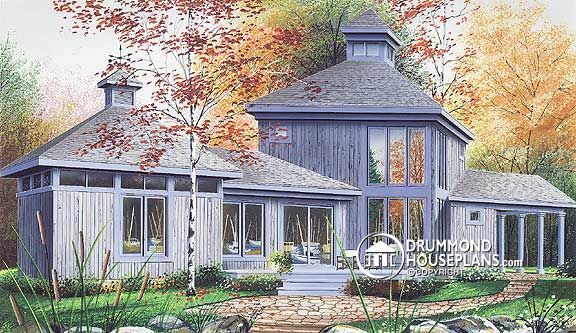 Check our Vacation and Cottage Design Collection or use ourAdvanced Plan Search to find homes with specific features, or Create a “New House Plans – Latest Trends” Alert to receive all of the latest designs direct to you by email!